With the SIGNA Pioneer and Magnetic Resonance Image Compilation (MAGiC) one-and-done imaging productivity tool, clinicians will be able to generate multiple image contrasts in a single MRI scan of the brain, including T1, T2, STIR, T1 FLAIR, T2 FLAIR and PD weighted imaging. Both the systems and the application are pending US FDA 510(k) clearance. According to the company, MAGiC that allows the acquisition of six contrasts in as little as one-third the time, which could enable the scanning of one more patient per hour, every hour of the day in neuro imaging. The contrast of images can be changed even after completing the scan by moving the cursor in the MAGiC interface to change acquisition parameters such as TR, TE and T1. The tool is the result of a collaboration with SyntheticMR AB. 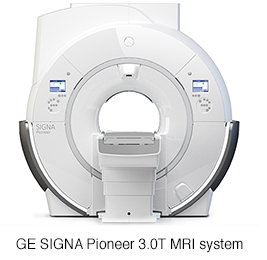 SIGNA Pioneer also features an enhanced Silent Scan package for use in MSK and spine imaging and Total Digital Imaging (DTI) technology enabling improved image quality and increased signal-to-noise by up to 25%. From RSNA 2014 — Six MR Image Contrasts in One Scan. Appl Radiol.